Photo courtesy Cushman & Wakefield | Thalhimer. A Richmond office building has sold for $56 million, according to Cushman & Wakefield | Thalhimer. The firm says Markel | Eagle Partners sold the property, located at 9954 Mayland Drive, to an undisclosed buyer. 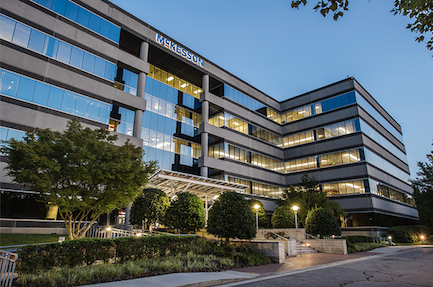 The 355,449-square-foot building serves as the headquarters for McKesson Medical-Surgical, Essex Bank as well as the East Coast claims and billing center for Travelers Insurance. The Class A property is 98 percent leased. The building recently underwent a $19 million renovation. Improvements include a new parking garage, roof, fitness center and cafeteria. Thalhimer’s Eric Robison and Eric Berkman handled the sale.